Please fill out the brief form below. If you would like to receive Mtech news and event updates via email. Never did Ryan Fisher (’12, M.S. ’13 fire protection engineering) imagine as a University of Maryland student that one competition would spark his career—yet it did. “The A. James Clark School of Engineering is the entire reason I’m on this career path,” says the co-founder and chief operating officer of Baltimore-based wood-burning stove startup MF Fire. 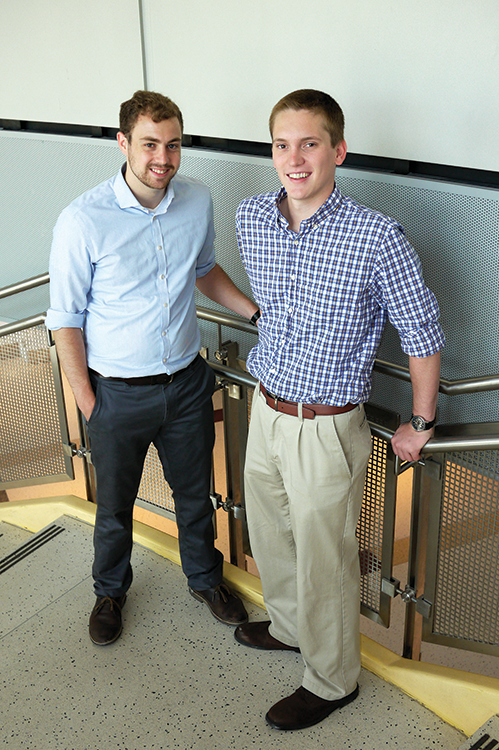 In 2013, Fisher and a multidisciplinary team of engineering students, including MF Fire co-founder and Chief Technology Officer Taylor Myers (’12 fire protection engineering and astronomy; M.S. ’14 fire protection engineering), competed in the Alliance for Green Heat Wood Stove Decathlon. The competition sought to promote eco-friendly stove designs. The only university team to make it to the finals, the Clark School team won first place in the “Particulate Matter Emissions” category, and their almost emissions-free wood stove design was featured by Popular Mechanics and National Geographic. What MF Fire has built is the cleanest and most efficient wood-burning stove ever tested. It’s also the first to use smart control technology. To bring the company’s current model, Catalyst, to market, the student engineers teamed up with business veteran Paul LaPorte, MF Fire’s chief executive officer. The company’s second stove model, Nova, will be available before the 2018–2019 winter heating season begins. Together, Fisher and Myers harnessed the power of competition to turn imagination into innovation and entrepreneurship into success, amplifying the Clark School’s impact on global issues. Read more about student competitions at the Clark School in our Spring 2018 issue of Engineering at Maryland magazine. ©2018 Maryland Technology Enterprise Institute, A. James Clark School of Engineering, University of Maryland. All Rights Reserved.